The 2010 season opened with a welcome back to Bewl for racing on Sunday, with the Club saying they had missed us. 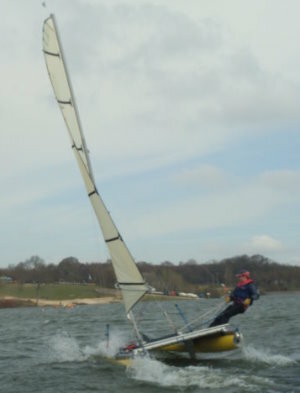 The boats down on Saturday had a sunny first contact with the water for 2010, in fresh breezes. The same fresh and gusty NE breeze came back for Sunday, coming in unobstructed over the dam to all parts of the reservoir. The club laid on a �W� course (which once understood gave two long beats and two broad runs) and slotted us in a small Fast Handicap fleet. 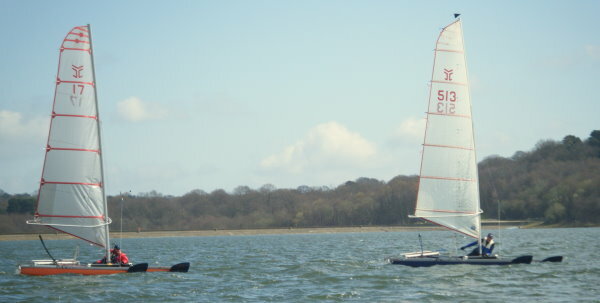 The wind gave constant trapezing conditions throughout the four races on the day, around 20 knots, dropping and gusting 5 on either side, with occasional heavy puffs needing some delicate bearing away at the two upwind marks. In Race 1, Alastair Cliff and Alex were away well, staying close while Alastair led around the first mark, dropped back under Cliff�s pressure on the first run, and then led again after the beat. Alex and Cliff powered past on the run, and Alex then pulled away enough to hold first over the remaining laps. Beginning the fourth lap beat, gusts tangled and tipped Paul, the boat turning turtle quickly. In the struggle to right, it became apparent that the mast had taken in water, sentencing Paul to a long cold time in the water, extending into the next race. Race two started very quickly back to back. Cliff saw Alastair making mainsheet adjustments oblivious, and sportingly risked his start to shout out a one-minute warning. Powering back down, they managed good starts only for Alastair to repay Cliff by unavoidably catching him on port in the starting pack. Alex pulled out in front on the first beat, and Cliff had chased down Alastair and then John by the end of the lap. Alastair close behind had the tiller bar pintles loosen to jam the rudders, and after near misses in the fleet had a shore trip for spanners, trailing permanently well last. Meanwhile, Alex� speed and pointing let him grab a lift which powered him straight up to the second windward mark without tacking, opening a lead which took him away, never to be seen again. Cliff won the close battle with John, holding second. Race three after lunch kept the same �W� course, with the wind piping up. Again the boat speeds were close upwind and down, but Alex pulled gradually away and Cliff kept John at bay enough to lead round each lap. Alastair dropped back, and these positions held round the shorter race.